One of the loveliest motorcycles at the Dania Beach Vintage Motorcycle Show Jan. 30 was this 1937 Nimbus Luxus combination. Robert Chambers of Miami was busy wiping away grease that apparently only he could see when I walked up. 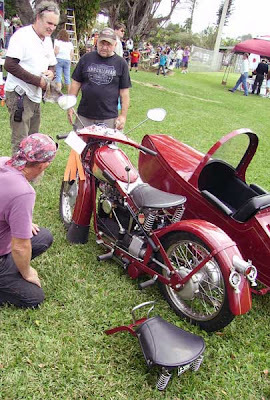 Everything about the motorcycle and sidecar looked wonderfully made, and Chambers was interrupted in his cleaning task by many people with questions. "It's a Nimbus, from Denmark," he explained. "They also made vacuum cleaners. If you look carefully at the tip of the muffler you can imagine it being the end of a vacuum cleaner hose." There were other mysteries, too, like the gear shift hand lever on the left. There is a clutch lever on the left-hand grip. So how does the rider use the clutch lever and move the gear shift with the same hand? He doesn't. Chambers pointed to a foot clutch pedal on the left of the bike; that's what you use when you want to shift! The Nimbus was special for other reasons. It had a four-cylinder, in-line engine, three speeds and shaft drive. 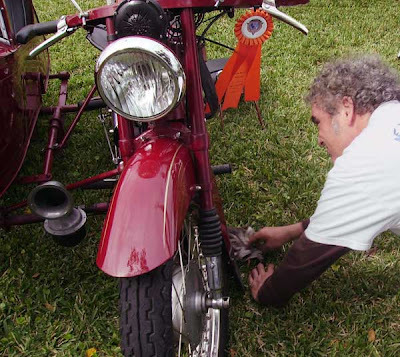 It is said to be the first production motorcycle to have a telescopic front fork. The Nimbus often came from the factory with sidecar attached. 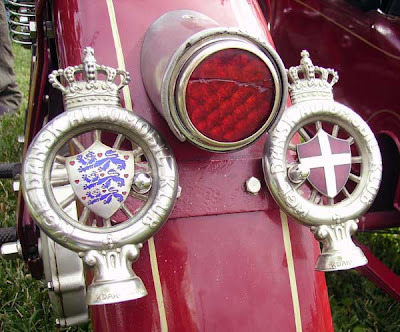 It served with the Danish Army, police and postal service. Design changes were few, production was slowed during World War II, and few were ever exported. All had 750cc motors and were not fast. 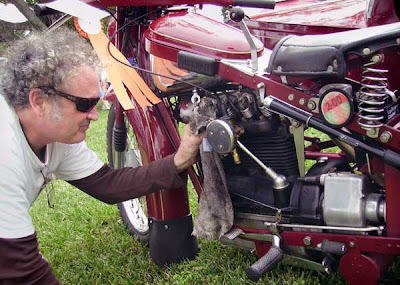 Note the handy air pump attached to the left side of the motorcycle. Chambers was happy he made it to the show. He nearly didn't. "When I was trying to push it onto my truck the ramp slipped and (the clutch lever) busted my sunglasses." Lots of spectators were happy he persevered. It's not a 1937 - it's a late 1938 or 1939. The brakes are wrong. In 1937 they still had the small brake drums.